Organic Tapioca Syrup, Organic Evaporated Cane Juice, Oraganic Honey, (Organic Grape Juice Concentrate, Ascorbic Acid), Pectin, Citric Acid, Organic Color [Black Carrot Juice Concentrate (red)], Natural Flavor, Potassium Citrate, Organic Sunflower Oil, Carnauba Wax. Consume 5-10 chews every hour during activity. Organic Tapioca Syrup, Organic Sugar, Oraganic Honey, (Organic Grape Juice Concentrate, Ascorbic Acid), Pectin, Citric Acid, Colors, (Organic Black Carrot Juice Concentrate, Organic Turmeric), Natural Flavor, Potassium Citrate, White Tea Extract, Organic Sunflower Oil, Carnauba Wax. Organic Tapioca Syrup, Organic Evaporated Cane Juice, Oraganic Honey, (Organic Grape Juice Concentrate, Ascorbic Acid), Pectin, Citric Acid, Organic Colors [Black Carrot Juice Concentrate (red), [Annatto (orange)], Natural Flavors, Potassium Citrate, Organic Sunflower Oil, Carnauba Wax. Organic Tapioca Syrup, Organic Sugar, Oraganic Honey, (Organic Grape Juice Concentrate, Ascorbic Acid), Pectin, Citric Acid, Natural Flavor, Potassium Citrate, Organic Color [Black Carrot Juice Concentrate (red)], Organic Sunflower Oil, Carnauba Wax. Organic Tapioca Syrup, Organic Evaporated Cane Juice, Oraganic Honey, (Organic Grape Juice Concentrate, Ascorbic Acid), Pectin, Citric Acid, Organic Turmeric Color, Natural Flavor, Potassium Citrate, White Tea Extract, Organic Sunflower Oil, Carnauba Wax. Organic Tapioca Syrup, Organic Evaporated Cane Juice, Oraganic Honey, (Organic Grape Juice Concentrate, Ascorbic Acid), Pectin, Citric Acid, Potassium Citrate, Organic Color (Annatto), Natural Flavor, Organic Sunflower Oil, Carnauba Wax. Organic Tapioca Syrup, Organic Evaporated Cane Juice, Oraganic Honey, (Organic Grape Juice Concentrate, Ascorbic Acid), Pectin, Citric Acid, Natural Flavor, Potassium Citrate, Organic Color [Black Carrot Juice Concentrate (red)], Organic Sunflower Oil, Carnauba Wax. 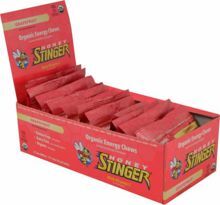 Honey Stinger Organic Energy Chews are formulated specifically for health-conscious individuals and athletes seeking a great tasting energy snack. * Honey Stinger Organic Energy Chews are unique as they are the first to include naturally occurring fiber and protein derived from 100% Organic tapioca syrup and honey. Made with USDA certified Organic ingredients. Gluten-free, dairy-free, non-GMO ingredients. 0g Trans Fats and no partially hydrogenated oils. 100% RDA Vitamin C along with 1g protein and 1g fiber per package. Adults and kids love them!